One word: steam. Lots of steam in the first five minutes of baking. But be aware that many home ovens are not designed to handle the kind of steam required to make really crusty bread, so try it at your own peril. What is the best way to store a loaf of bread? Crusty bread: paper. Soft breads: air tight plastic. It is that simple. Either type of bread can be wrapped in plastic and frozen, though I don't find crusty breads ever to completely recover. I have a question: When I make a free-form bread, I am always afraid that when I have a slightly moister loaf, the dough will spread and not have the correct shape. By slack, what consistency would I look for? I made the baguettes from the "Artisan Baking" book for New Year's Eve, and even though I added more flour than it asked for (thus creating a slightly firmer dough) the holes were wonderful and the texture was amazing. I also made the English muffins from "The Bread Book" twice, one with a soft dough (what the recipe called for) which spread, and one a bit firmer, which didn't. Even though I have been baking bread for a while now, I am still wary about the soft doughs. What do you do? At the moment I am a huge believer in "the wetter, the better." Wet doughs and folding have resulted in huge improvements in the quality of my breads. I say some day when you are baking a batch of bread make another batch and leave it much wetter than you think you should. Use a lot of flour on your hands and your work surface and give it a shot. I bet you'll be pleasantly suprised with the results. 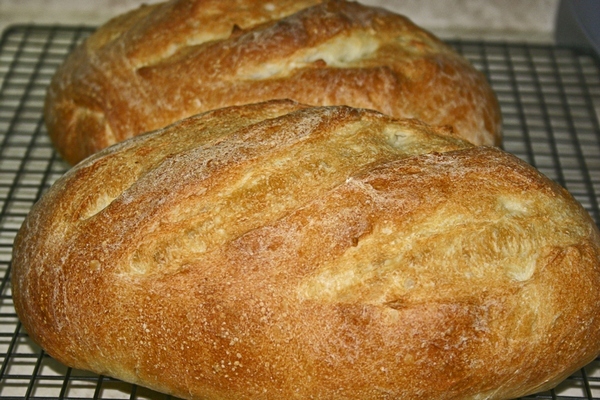 I've yet to make a standard French Bread dough that was so wet I couldn't bake it. The two or three batches of overly wet dough I've made have been either contained potato, which actually releases moisture as it ferments, or been sourdoughs, which I still don't have a handle on. Does all the hydration result in an overly sticky dough? How do you manage that? I've been trying to make Pan au levain using the autolyse technique and so far I've been ending up with incredibly sticky doughs. That sounds good, I'll try that next time. But what do you do to keep the dough from spreading too much? Folding, as they mention in the link above (and as I will mention in my next article) tightens the loaf up a great deal. 90% of the time two or three folds are enough to tighten a dough up sufficiently that it'll hold its shape. If it isn't there are a few options: one is to let the dough rise in a brotform, as seen here. I fake a brotform by using a couple of small, round baskets I picked up at Goodwill for a buck each. Flour them well before placing the dough in them though or it'll stick. Another trick is to use tea towels or something to hold the loaf in place while it is rising. I did that this weekend: I put a sheet of parchment on a baking sheet and sprinkled some semolina flour on top. I then rolled up three tea towels and placed one down each side and one down the middle. I sprinkled some flour on them and then placed my two log shaped loaves in the channels between them. I put the entire thing inside a plastic bag for the final rise and then removed the towels and slid the parchment onto my peel to transer them to the oven, baking them on top of the parchment on a baking stone. The towels forced the loaves to rise up instead of spreading out. The resulting loaf was very nice. Agreed. But one of the bests ways I've found to achieve good surface tension with really slack doughs is by folding. Each time I fold though surface tension gets a little bit greater. For final shaping I just need to repeat and preserve that. I have been very impressed with the difference folding makes. It is a technique I read about here and found it can make a huge difference on the final bread. It is amazing how the slow and gentle method for developing the gluten helps the shaped loaf keep its shape. I tried a sourdough last weekend, and forgot that as the dough ferments it often seems to loosen up, thus causing flat loaves. However, with a slightly extend fermentation and an extra fold or two I had no problem with the loaves holding the shape. Can you please help me to create those wonderful holes in your bread? I tried your online technique but didn't work (5 times). 1. Mix your dough and let it rise. 2. When it 2x the size fold it like a letter on all sides. 3. When it 2x the size again fold it once again. 4. Let it rise to 2x the size and shape? I find that a longer rise makes bigger holes. Not sure how long the doubling takes, but try leaving it out for several hours (ex. 4 or 5) even if it's already risen 2x. Also when you shape it, try and be as gentle as you can, and then let it rise again after shaping (an hour or two). before going right into the oven. I think you should have lots of big holes then. Hello...I'm looking for the name of a baked product my mom baked years ago...I remember it required rolling cold sweet yeast dough into a rectangle, spreading butter on it, folding it up, then repeating several times...this made the rolls or what-ever very flaky & rich...she eventually made a snail-looking thing and I think she put some kind of pineapple preserve in the center, or perhaps cream cheese, then baked after rising...seeing a pic of the Cream Cheese Snails, reminded me of this product...does anyone have a clue or recipe? This sounds like puff pastry, which has another name which I can't remember right now. I think it's also how croissants are made. KipperCat is right. There is all kinds of info if you search under "croissants" in here. Also known to me in German as: Klassische Blätterteige, Falscher Blätterteig, Blitzblätterteig, Hefeblätterteig, Plunderblätterteig, or Quarkblättereteig depending upon the ingredients and amount of butter. I have recipes where flour is combined with the butter (50g flour to 120g Butter or 100g flour to 250g Butter (for use with 500g bread dough) and shaped into a brick before being covered with yeast dough and rolled out, chilled and repeated. The dough can be cut also into stripes and wraped around metal forms & funnels, and stacked to be baked and filled with creme de whatever good and rich, tasty, messy and fun. Chocolate drizzle and/or powdered sugar dusted, popular toppings both. I had always been intimidated by croissants, but felt annoyed by the poor quality of most of the store-bought products. So, I finally decided to take the plunge. I found a good recipe that I have now made a couple of times. It is amazingly fool-proof and results in the best croissants I have ever had. You are in for quite a treat. I have since cleaned up the instructions a little bit and converted them to metric weights, which makes them more reproducible than volume measurements. It's still a good amount of work, but not really any more than making a nice loaf of bread. In fact, I can make croissants at the same time that I can make bread. The various waiting times nicely interleave. Note: When the recipe calls for European-style butter, it isn't kidding. European-style butter is much softer when chilled than American-style butter. That makes working with it so much easier. I don't think I would attempt this recipe with American-style butter. My local grocery store carries Kerry Gold, which works fine; but other European brands should be OK, too. If possible, try to buy unsalted butter. Excuse me for replying to this older thread. I am searching for something else and the title caught my eye. We freeze crusty bread all the time. I usually make two loaves at a time. There are only two of us so we can only eat one of the loaves. We double plastic bag the other loaf (removing as much air from the bag as possible - without distorting the loaf). This is done after the bread has cooled completely. Then into the freezer it goes. Either type of bread can be wrapped in plastic and frozen, though I don't find crusty breads ever to completely recover. We have not found this to be the case. To refurbish unsliced crusty bread that has been frozen, thaw the bread on the counter in its freezing bag. Once it has thawed, remove it from the bag. Preheat the oven to 500F. Turn the oven OFF. Put the bread on the middle rack of the hot oven for about ten minutes. Using that method, the crust and crumb are virtually the same as they were when the bread came out of the oven on the day it was initially baked. Agreed. In fact, if I'm impatient, I'll follow Reinhart's instructions in the BBA and place the loaf in the oven at 400F, covered by a damp towel, for ~15 minutes (re-wetting the towel to ensure it doesn't score) to defrost, then another 10 minutes uncovered to crisp up the crust. The result is as good (or, at least, good enough to be essentially indistinguishable) as if it came straight out of the oven, at least in my experience. Hello. Have any of you used a regular floor tile for your baking stone. I read you could use an unglazed one. I have some 14 X 14 tiles left from when we built our house, but they do have a glaze on them. Any suggustions or advice? Hi Syb..no do not used glazed tiles, unglazed only or purchase a baking stone. I am trying to build a sourdough starter ala Peter Reinhart, but am unable to find diastatic malt. My local homebrew store has malt powder, but it does not have the active enzymes needed. A local health food store cannot get it as it has a very short shelf life. Can anyone recommend a source for this ingredient? I buy it on Amazon. Just search for diastatic malt. pretty cheap, lasts a long time. Also I buy the big package of yeast the same way. I live in an extremely hard water area and use Britta filters to remove the softener salts before I use the water to cook or to make coffee or tea. For my kettle or coffee maker, I use water that has been softened and then put through two Britta filters. For cooking, I use soft water that has been filtered once through a Britta. I wouldn't want to risk a batch of bread with soft water, but the soft water is easier on the filter than hard water. I'd imagine you will get more consistent results from the yeast with filtered water. Overdue, but hope that helps! Hi, Ombra. I have successfuly used seitan (obtained by washing and draining a dough) in wholewheat based recipes, it works just fine. Only, make sure to cut the seitan to small pieces and distribute them evenly throughout your dough and knead them properly in, otherwise you'll have unblended strandes of gluten. However, you could do just fine without added gluten, if you good wholemeal bread flour with protein level 11.5% or greater. Try to incorporate a preferment, and a soaker. Search in this website for the epoxy method dicussed in depth by famous Master Baker Peter Reinhart in His book " Whole grain breads. I have no clue OMBRA..use only sparingly, as excessive gluten can make your bread rubbery. I'd use a maximum of about 50 grams of seitan for an 850 grams dough. Try 35grams for a starters, and work your way up in future bakes. Remember though, your have to mix really well to get seitan to incorporate well. I wanted to read about slack dough, but the link is broken? And what does "folding" look like? meanwhile: slack doughs, what does folding look like? a mess! Lol! Actually the idea is to turn a mess into something constructive. Scrape or plop the dough (top side down) out onto a floured surface and pick up the edge of one side with finger tips and pull upward and outward quickly and plop it over onto the other sticky dough lying there. It should look like a folded half round sticky object with two layers. brush off any excess flour that may prevent the next fold from sticking. Now take the opposite side of the fold and pull it up and out resting it on top of the dough. Then do the ends. That is one round of 4 folds. (some will call that "one fold") Now flip the mound of folded dough over and keep track of the top. Place back into the bowl to rest or just cover and rest. As you fold, the wet dough will tighten up and be a little bit higher each time you complete a round of folds. This video archived on PBS "Baking With Julia: Decorative Loaves with Steve Sullivan" (http://video.pbs.org/video/2250834031) is fabulous. Go to 08:34 to see the section on folding. I have read that a person can double a recipe, but my question is, do you double everything including yeast or starter ? Thanks. To get twice as much out, twice as much has to go in. It's easiest to work with baker's percentages and weights, since the proportions stay the same regardless of how the quantities change. Volume measurements can be harder to work with. My bread is tasty with a soft crust, which is what I want, but very dense. I'm using a recipe in "The Bread Baker's Apprentice" ( Variation 1, p.266). It contains powdered milk, eggs, and butter. How can I "loosen up" my bread? Is my problem the flour/ liquid ratio, knead time, or what? Baking is my new hobby, so I'm just feeling my way. But I'm having a lot of fun with it. Thanks for your comments. How to add raisin to the bread? Can the authors or anyone give me an idea of conversion of amounts to Australian. ie I converted USA cups of flour to Australian cups and thus into grams. However, because the flour isn't compacted in your cups in the master recipe, it means I have added way too much flour. Then just guessing water. Any ideas please? Could someone tell me how much a cup using sweep and level method actually weighs... in grams? Thank you. and any volume measurement is that they can vary from one cup to the next, even with the same person, cup and flour. When I convert American cup recipes, I tend to go with 125 to 130g and see where that takes me then adjust with the second round of that recipe. Weighing water and flour in grams will save a lot of guess work in the long run. An american cup of water is, well, I use 240g. Metric cups are also available with one cup of water 250g. You could take any vessel and use as a "cup." A cup of flour weighs roughly about half a cup of water. If the cup flour amount is twice the cup water amount, that is too much water or roughly 100% hydration in the recipe. Most flours are not absorbent enough for that much water. A 50% hydrated dough would be 4 cups flour to one cup of water, roughly, and that may be a very stiff bagel or pretzel dough. So the suggested method is to add the one cup of water to the flour, stir and then splash in as much as is needed from the second cup while stirring to moisten most of the flour, let the dough rest before adding more water. Most likely less than half a cup more water is needed for most doughs. Most wheat doughs are between 50 to 70%. I am a newbie to baking without a Bread machine. I only have a Countertop Oven hopefully I will be able to put a photo on. I have been working on making Baguettes again a photo? These are the ones I made this morning, they don't seem to get the scores to open up. I would appreciate any help on the running temp of the oven... I have been running it at approx 200c. Granny, they look better than mine! They look good from here! Might want to rethink scoring. When ready to score. Think of a toy train track running down the top length of the dough, not quite one inch wide between the tracks. Take your blade and rotate your hand until it looks like you want to slice off that track. You want to score inside that train track about four inches long. Start your score at the upper right edge of the imaginary track and cut toward the left track reaching it about 4 inches down. Back up a good inch, maybe one and a half inches and make a second score from the right track to the left track leaving a thin strip of connecting dough between part of two scores. Watch your blade angle keeping it flattish, back up an inch, back to the right train track and score again ending on the left track. Finish. With the second loaf, you can space the lines better to your liking, but the trick is to score with the length of the loaf not square across it. And to leave thin enough stripes between the scores to just hold the rising dough together in those spots while the openings expand. There are videos here but I can't seem to figure out how to post a link using my iPad. Site Search: Scoring baguettes. These are the fourth day of trying. Made my starter on the 18/2 and this Morning made 4 Baguettes from it. It is a great shock to one that tried handmade bread a 100 yrs ago and brought a bread machine instead....couldn't handle the little bricks I was getting by hand.. Anyway fast forward a 100 yrs and found this site while surfing and decided to give hand made another go. I was pleasantly surprised with the result see prior pics.. I have baguette dough fermenting in the fridge that went in at 4:00 pm yesterday. It is supposed to double by 4:00 am to 4:00pm. So far I see no movement in the Camco container at 7:00 am. My question is, does the long ferment help mostly with building flavour. The sourdough starter was really active when I started and I could see signs of fermentation when the dough went into the fridge. Thank you for your thoughts, I am new to this fine craft.